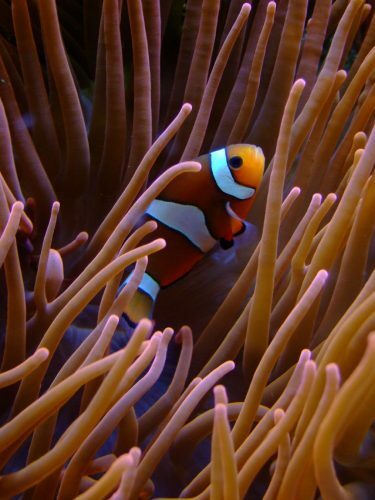 Clownfish are probably the most common saltwater aquarium fish. They are beloved by almost every aquarist because of their striking coloration, hardiness and symbiotic relationship with their host anemones—which incidentally aren’t required to have a success with clownfish in captivity. Who doesn’t love a clownfish? Another great aspect of raising clownfish in a saltwater aquarium is that pretty much any two juvenile (small, immature) clownfish of the same species will become a bonded pair. The reason clownfish pair up in an aquarium so readily is because they are protandrous hermaphrodites, a fancy phrase that means that the fish start off male but can change gender to become female. When clownfish pair-up, they establish a dominance hierarchy, also sometimes thought of as a pecking order. In the pecking order, the most dominant fish grows the largest and becomes the female, while the smaller fish becomes the male. If there are three or more clownfish in the tank, than the more dominant of the two smaller fish will become the male and the third (or third, fourth, fifth and sixth…) fish will most likely remain juvenile. To establish dominance, the clownfish will ‘attack’ each other—by charging, chasing, shuddering and biting. A recent study showed that in addition to those physical displays, the clownfish also ‘talk’ to each other, by making noises. Larger, dominant fish make threatening popping noises by snapping the teeth in their jaws at smaller fish, while the smaller fish display submissiveness by shuddering their heads and making a clicking or chirping sound. It was not clear to the scientists conducting the study how the submissive fish made the clicking or chirping sounds. Interestingly, the clownfish study showed that the clownfish did not use sound to attract their mate or initiate mating activities. This is thought to be unique among the 360 other (non-clownfish)species of fish in the Pomacentridae family. The study was published in PLOS One , a peer-reviewed open access journal. The journal article is interesting to read, and if you’re a real fish nerd like me, scroll to the bottom of the article, under the Supporting Information headline, where you can download a short audio/video clip of the clownfish and hear some of the recorded sounds. That awesome clownfish photo was taken by Marfis75 and can be found on Flickr under creative commons license.